When Police Come Near, BB Guns Look All Too Real BB guns and other air pellet guns are often made to look like real guns. That's a problem for police, and it puts kids in danger. A Baltimore police officer shot and wounded a 14-year-old boy in April after spotting him with a Daisy Powerline 340 BB gun, right. 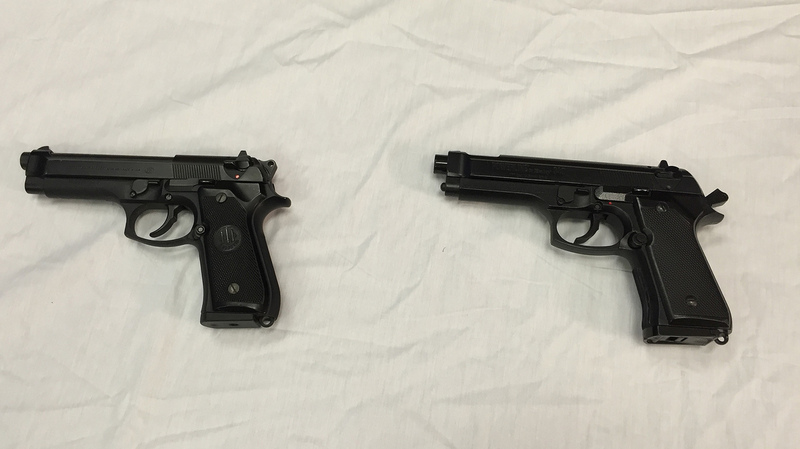 A semi-automatic handgun, pictured left, provided by police shows how similar the models look. Twelve-year-old Mannie Thames knows a lot of kids with BB guns. He says kids have them for safety and because they're cool. "Sometimes people get bullied a lot, and they want to have something to protect their self," Thames says. "And sometimes people think it's cool, they want to shoot people for fun." He explains this in between bites of snacks at the after-school center, Penn North Kids Safe Zone, in West Baltimore. Replica guns that shoot BBs and other projectiles are popular with kids. But in some settings, they pose a special danger. Twelve-year-old Tamir Rice had an air pellet gun that looked like a handgun when he was shot and killed by Cleveland police in 2014. Earlier this year, after a 150-yard chase, Baltimore police shot 14-year-old Dedric Colvin, who had a BB gun that looked like a real pistol. That teenager survived, but it drew new attention to what can happen when kids in high-crime areas carry what look like real guns. Thames' mother had strong words for him about guns, telling him not to play with them because they are bad for him and could get him killed. But Thames admits that he has bought BB guns in the past. Since he heard about the boy who was shot, however, "I'm not going to buy one never in my life no more." Asia Moss, a middle-schooler, says she was shot with a BB when she was younger. She says the kids who are toughest have BB guns, pocket knives or Mace. "They use it for protection, but some of them just use it to be fun and they use it to harm other people and think it's fun," Moss says. BB guns have sparked discussion among parents. Kim Shelton of East Baltimore says her 11-year-old son was used to playing with them. She has tried to change that, but a few months ago she saw him playing on the street with a BB gun. "I was looking outside my window," Shelton remembers. "And I ran downstairs and I said to him, 'Please, I don't ever want to see you playing with guns ever again,' because to me it looked like a real gun. I was hysterical." Federal law requires toy guns to have a colored cap to show they're not firearms. But BB guns, a type of air pellet gun, don't have that requirement. In Baltimore City it's illegal for a minor to possess a BB gun. Still, state lawmakers are trying ban the sale of so-called imitation firearms altogether. T.J. Smith of the city's police department says you have to consider the environment: In high-crime neighborhoods, officers often need to make decisions in seconds. "When you have a realistic-looking gun that is down to the T and the only thing and the only way you know that it's different is by staring down the barrel of it, that sometimes is going to be too late," Smith says. He points to several arrests where police have recovered a mix of actual firearms and replica guns, and to a case where a suspect was carrying a real rifle that was pink. "We're not talking about young people or adults that are going out to shoot a barrel of hay on several acres of land," he says. "We're talking about in environments where we see crime, and where we see crime involving handguns." Joe Murfin, a spokesman for Daisy — the manufacturer that made the BB gun carried by Dedric — says they come with warnings that adult supervision is required and that misuse of BB guns could cause serious injury or death. "We also warn people not to brandish an air gun in public, that people may misunderstand what this is and it could be a crime," Murfin says. Still, those warnings can feel disconnected from inner-city realities. Ericka Alston, who directs youth services at the Penn North Kids Safe Zone, even bans water guns. "In West Baltimore: absolutely not. Not here," Alston says. "Not under my watch, because regardless if pink bubbles are coming out or green slime, kids will shoot to kill. It's still a gun." She says it's also another way to teach kids that guns — whether they're real or not — and gun violence don't have to be part of their communities.